Lisa from Talk Functions shares how she planned a magical day for Monja and Eugene. Monja & Eugene decided to get married in the Mother City and made the long journey from the Jacaranda City to our beautiful shores. Who can blame them when Cape Town is known as THE Wedding Destination. Monja arrived at the Groote Kerk in a Black & Ivory 1958 Jaguar. The Groote Kerk is the oldest Dutch Reformed Church in South Africa and its architecture boasts a peculiar combination of Greek and Gothic styles. It also has the privilege of housing the largest organ in the country and was used to play the Hymns. A very proud father with his daughter by his side walked down the aisle to the sound of the Classical Quartet playing “Pachelbel’s Canon” which is one of the most popular pieces of Classical Music in History. Monja had to contain her tears as best as possible has her dad gave her away. It was a very intimate service with close family and friends. Monja and Eugene stood proudly in front of the exquisitely carved Pulpit where the minister announced them Husband and Wife. 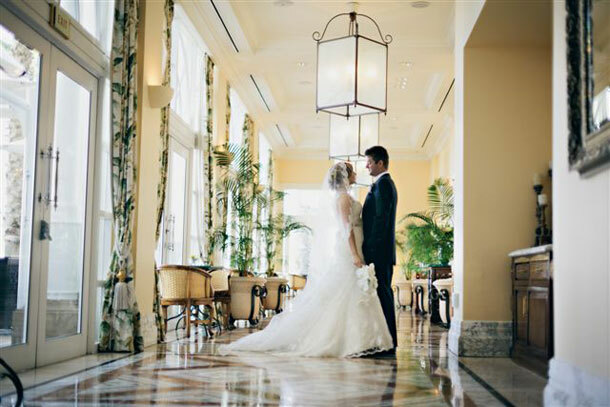 The Wedding Reception took place at the 5-Star Table Bay Hotel on the Historical waters of Cape Town’s Victoria & Alfred Waterfront in the imposing Ballroom with its majestic ceiling mounted crystal chandeliers. The Ballroom was beautifully decorated with white & cream flowers in silver containers. We used 5-arm silver chandeliers with crystal details and silver candles. The combination of black & white for weddings is one of those timeless classics that will never go out of style. We also brought in the colour silver which is sleek and modern and gives one a feeling of ornate riches. The stationery was personalized with the couple’s Monogram adding a traditional touch. We however wanted to add a modern twist to the stationery by incorporating bold stripes into the overall design. The favour boxes which were filled with Turkish Delight were beautifully wrapped and also served as seating cards. The table numbers were placed in white ornate frames. The other important finishing touches to the table setting were the silver cutlery and simple but stylish glassware and the high quality plush table linen. The 4-tired Wedding Cake with its black filigree piping was beautifully displayed for all to view on a grey plinth with a silver cake knife which was engraved with the couple’s names. After the cutting of the cake Monja & Eugene made their way to the black & white chequared dance floor for that very special and romantic moment: The First Dance. The DJ kept the guests on the dance floor for the rest of the evening. Annemari Ruthven Photography captured every moment with such style.